To gain a better understanding of how the opioid epidemic is impacting Michiganders, Lt. Gov. Brian Calley today signed emergency rules that require health professionals and facilities to report overdoses, including deaths, to the Michigan Department of Health and Human Services. The Michigan Osteopathic Association (MOA) has developed a strategy for combating the opioid crisis facing Michigan. The MOA's "5 Strategic Pillars" were developed based on recommendations from the MOA Presidential Task Force on Safe Opioid Use, the Michigan Governor's Task Force and The Office of the White House. On this page, you will find news and info about efforts from the MOA and around Michigan to lessen the burden of the opioid epidemic, a full cadre of resources and useful links for both providers and patients and a section on the MOA Presidential Task Force on Safe Opioid Use. Goal - reduce opioid-related deaths and morbidity, while we treat patients with pain and/or addiction with compassion and expertise. A great YouTube video on the MAPS launch detailing the improvements and the steps being taken to better track prescriptions and open communications between MDHHS and prescribers. 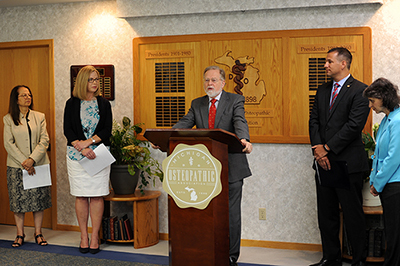 The Michigan Osteopathic Association (MOA) and the Michigan Association of Health Plans (MAHP) hosted a press conference addressing issues and resources related to the opioid crisis in Michigan. Joining the MOA and MAHP were a number of other organizations concerned with the resources designed to combat the opioid crisis, with a focus on pregnant women and infants diagnosed with Neonatal abstinence syndrome (NAS). New borns with NAS suffer from increased irritability, hypertonia, tremors, feeding intolerance, seizures and respiratory distress. The event featured a series of speakers from organizations who have joined in a collaborative effort to raise public awareness and alert legislators to the urgency of maintaining programs that are making a difference in treating addiction and preventing overdose deaths in our communities. The Center for Disease Control has released guidelines for prescribing opioids for chronic pain. The guidelines carve out an exception for patients receiving cancer treatment or end-of-life care. When doctors determine that such drugs are necessary in other situations, the CDC advises doctors prescribe the lowest possible dose for the shortest amount of time. There are many online resources available to learn more about the opioids issue in Michigan. The MOA has compiled some web links for you. In 2014, the Michigan Osteopathic Association developed an Ad Hoc committee to investigate the causes of the alarming rates of opioid abuse in Michigan. The committee soon transformed into the MOA Task Force on Safe Opioid Use. The Task Force was invited to have a member join Governor Rick Snyder's Michigan Prescription Drug and Opioid Abuse Task Force to develop recommendations on preventing the causes and addressing the addiction. The MOA Task Force continues to work on educating members, legislators, law enforcement and the public on the prevention and treatment of opioid addiction. This page offers resources and events to aid in that education. Thank you to all the attendees of the MOA Luncheon & Town Hall Meeting, Saturday, May 14. The event offered a distinguished panel of experts from the medical, legislative and law enforcement sectors for a town hall-style discussion. The event was moderated by Tim Skubick, Senior Capitol Correspondent and host of WKAR's "Off the Record," as an overflow crowd asked questions and heard from the various points of view. The event began with a message from Michigan Lt. Governor Brian Calley, Chair of the Governor's Prescription Drug and Opioid Abuse Task Force.